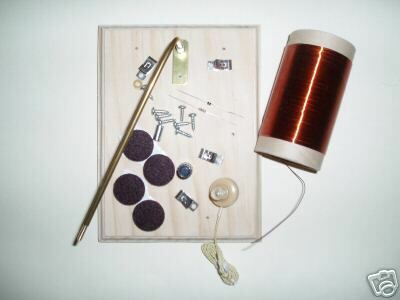 Here is a neat little Basic Crystal Radio Set Kit that makes a beautiful set just about anyway you finish it. 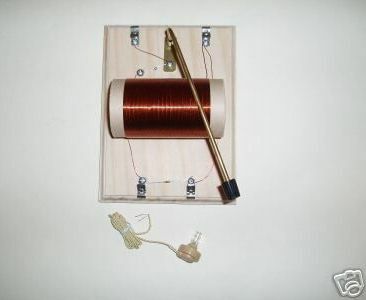 Features Brass Tuning Rod with frount board tuning. With Fanestock clips located at the frount of the board for easy earphone connection and antenna fahnestock clips located at the rear of the board to place the antenna out of the way. Easy no soldering construction makes this a great Grand/Dad and Grand/Son project. Features a pre-wound coil with #22 enamel wire on a tough pre-punched cardboard coil form. Select Grade Pine Mounting Board that is fully routered and drilled. his Radio makes a Great Gift and is sure to become a family Heirloom. NOT INTENDED FOR SMALL CHILDREN! MANY SMALL PARTS!